Duration: 6 hours 5 minutes without stops. Add around an hour if you want to include the Loumata tous Aetous nature trail in Amiantos. 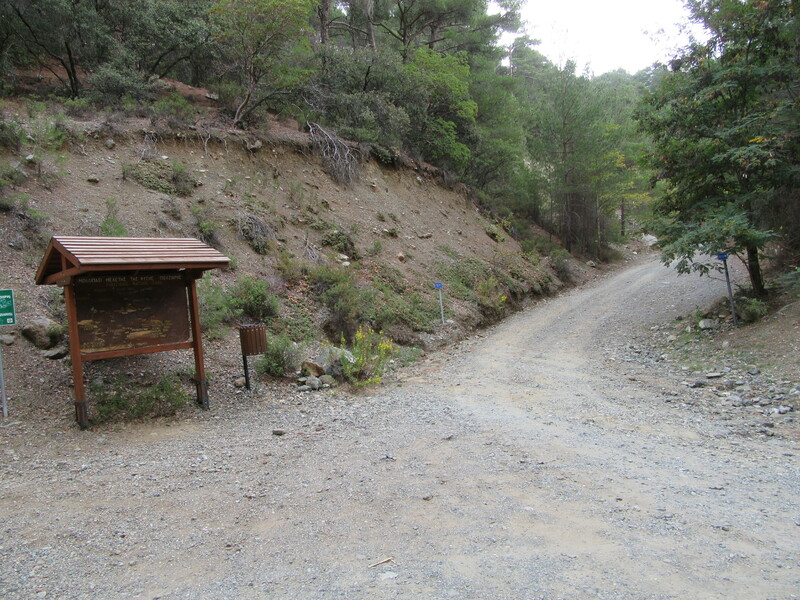 The walk starts at the Psilo Dendro nature trail board located just off the main B8 Limassol-Troodos road, above Pano Platres. There is (free) car parking alongside the entrance to the trout farm. Just off the road you will see a brown nature trail board for the Pouziaris trail. Follow the wide earth road which leads right from here. 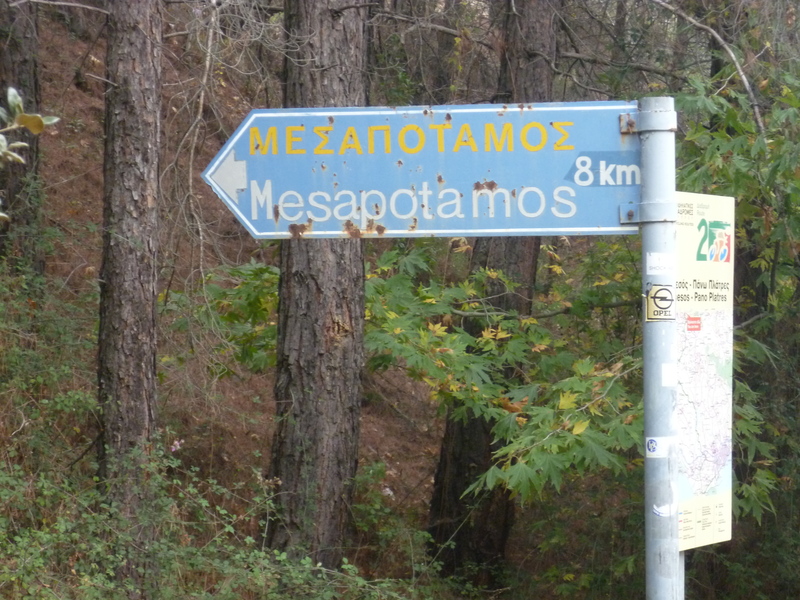 This heads uphill at an easy gradient for a short distance, then gently downwards for the easy 8km walk to Mesa Potamos. The path is also a designated cycle path with regular signboards and shelters (although we have never seen any cyclists when we have walked this route) so there is little chance of getting lost. A couple of minutes later note a strong track heading upwards to your left. Ignore this track for now and carry on following the main path – but later in the day you will return via this track. At approximately 1 hour 10 minutes the earth track becomes an asphalt road and, following this left around the mountain you will shortly be able to see MP monastery to your right and ahead in the distance. A further 10 minutes’ walk will bring you to the Archolakania picnic site and a spring (1 hour 20 minutes), with plenty of shade and an opportunity to refill water bottles. The monastery itself is just beyond the picnic site (1 hour 30 minutes). At this point we have tried – on more than one occasion! – to find a path to the left. This path is described in earlier editions of the Sunflower guide book (Walk 4), although there is no sign of it on Google Earth. And not much indication of it in real life either! We walked up a track to a water tank opposite the monastery. Behind the tank the path is very overgrown – we weren’t sure if this was the supposed track so we ended up returning to the road. 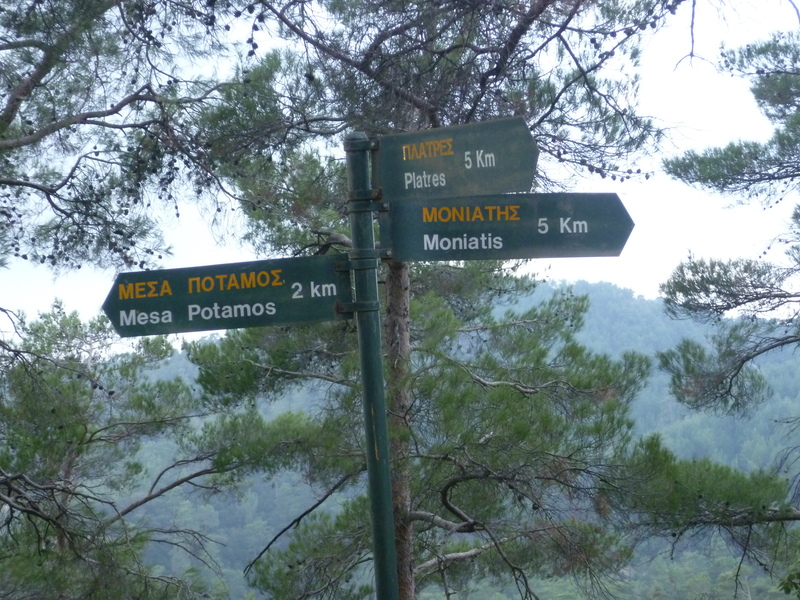 Here, just beyond the monastery, there is a sign to ‘Platres 7km’ to the right and to ‘Amiantos 7km’ to the left. We decided to take the road eastwards towards Kato Amiantos, at the same time looking for an uphill track to the left to take us up onto our originally planned route. Although we passed two possible tracks we were uncertain about both of them and reluctant to take the plunge back into the forest on the basis of CTO maps. In the end we walked almost all of the way to Kato Amiantos! 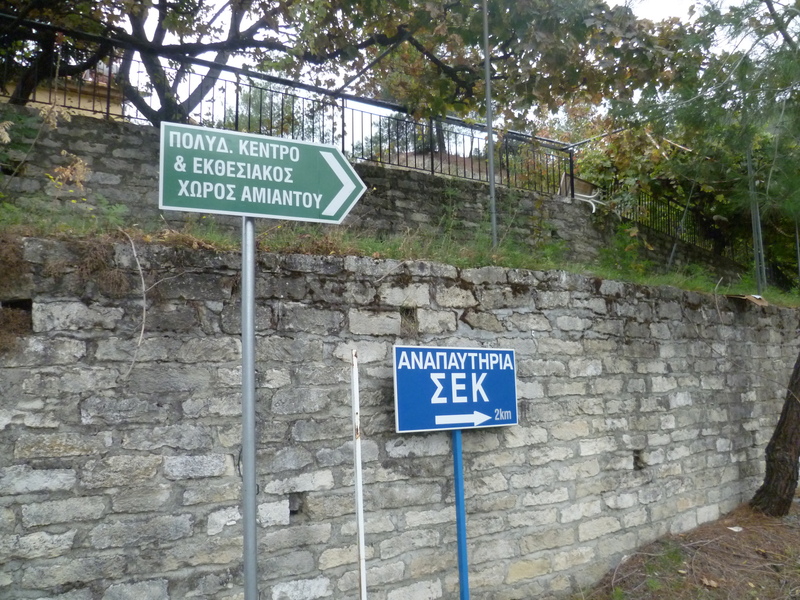 Follow Makarios street (quite steeply uphill passing some rather nice houses on your left and right and with the village of Kato Amiantos initially below you and to your right. The road continues climbing, then curves around and down until you come to Nikou Nikolau Street on your left (2 hours 55 minutes). Turn down here and, after a few metres, left up the hill along Griva Digeni Street towards the SEK holiday centre. Just before you arrive at the main entrance to the SEK centre look for a white trig point with number 66 painted on it on the right hand side of the road. Take the track opposite this which leads into the trees and gently downhill. After about 50m you will see a concrete water tank. 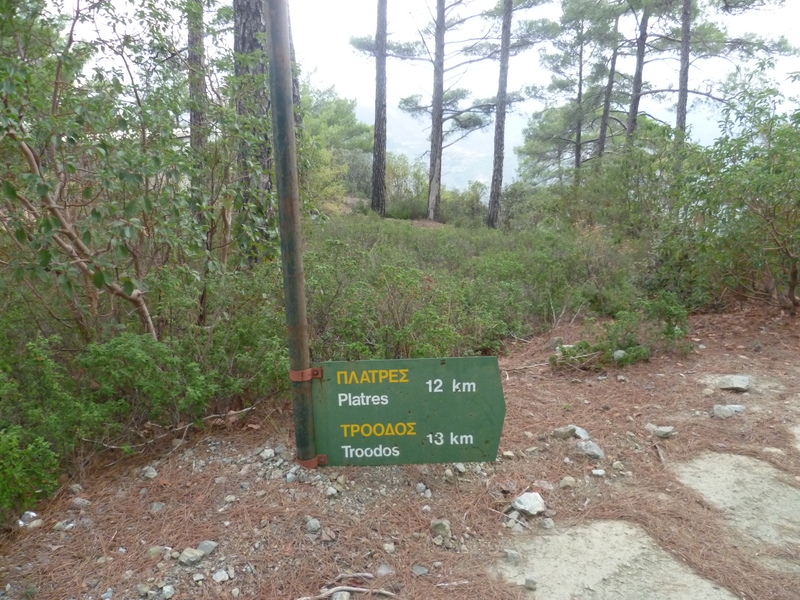 Look for a green signpost to Platres & Troodos 12 & 13km respectively. Follow the track indicated by the signpost. 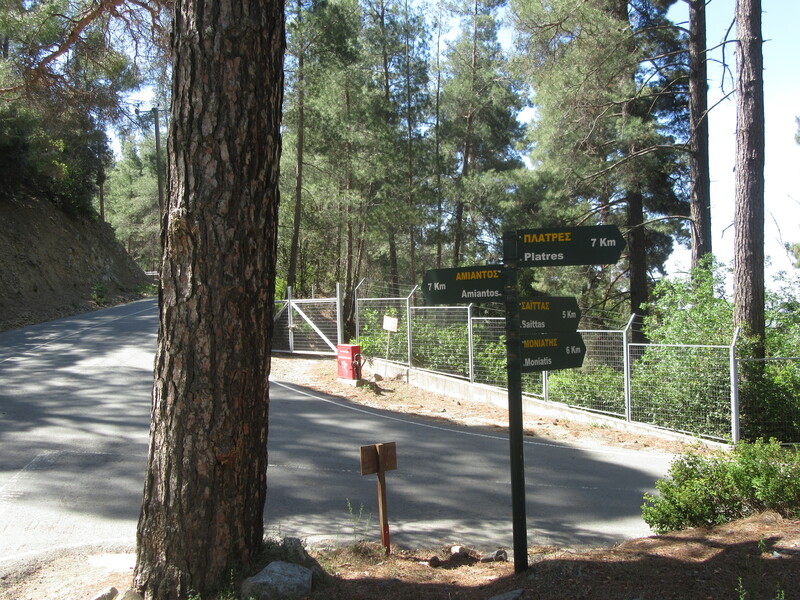 It is a decent earth road with lovely views and plenty of shade through a pine forest. Steady climbing but nothing too taxing. At around 4 hours 35 minutes you will reach a fork where another track heads to the right. Continue along your track to the left and downhill. 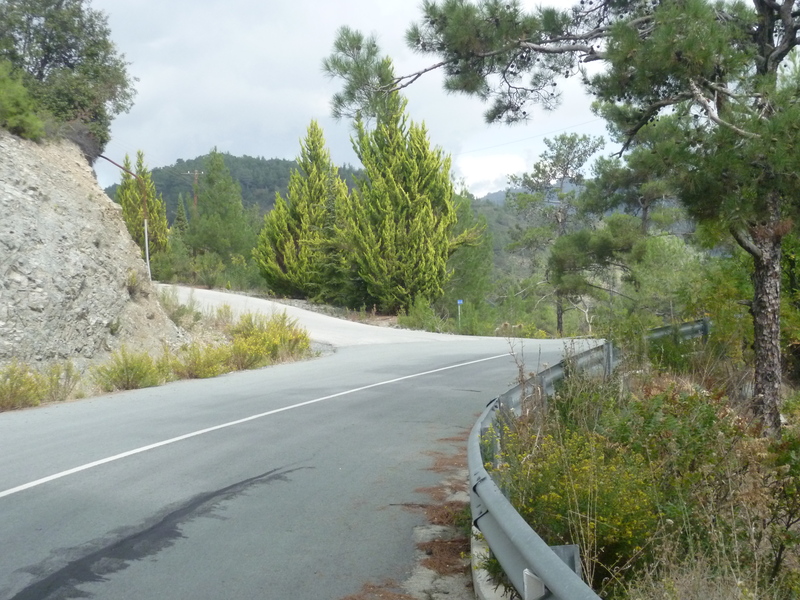 We think this – unsignposted – right fork is a long and winding road to Troodos, but we have yet to check this. At around 4 hours 55 minutes you will reach a right turn as the track reaches the top of an incline. 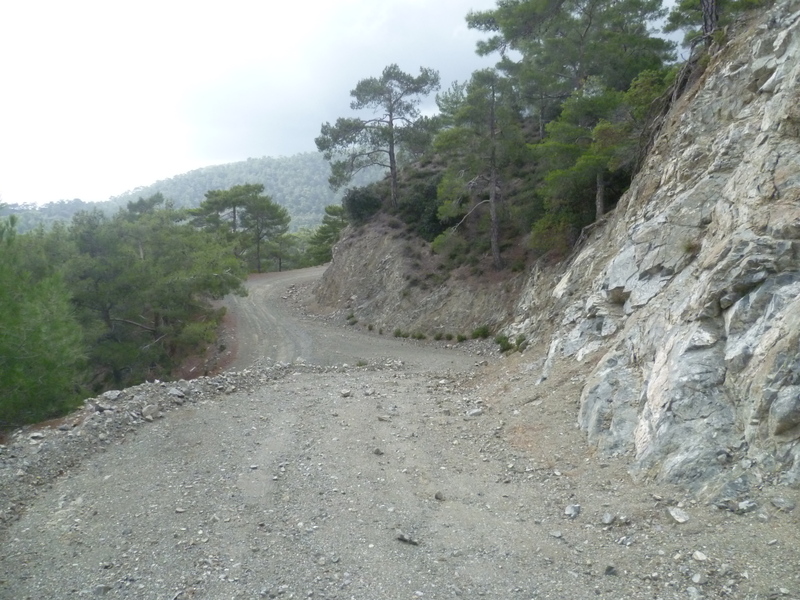 As you turn the corner the track descends and around 200m ahead you can see the junction where it rejoins the Psilon Dendron/Mesa Potamos road about 1km west of the monastery. You passed this junction earlier in the day at the 1 hour 5 minutes point of your walk. 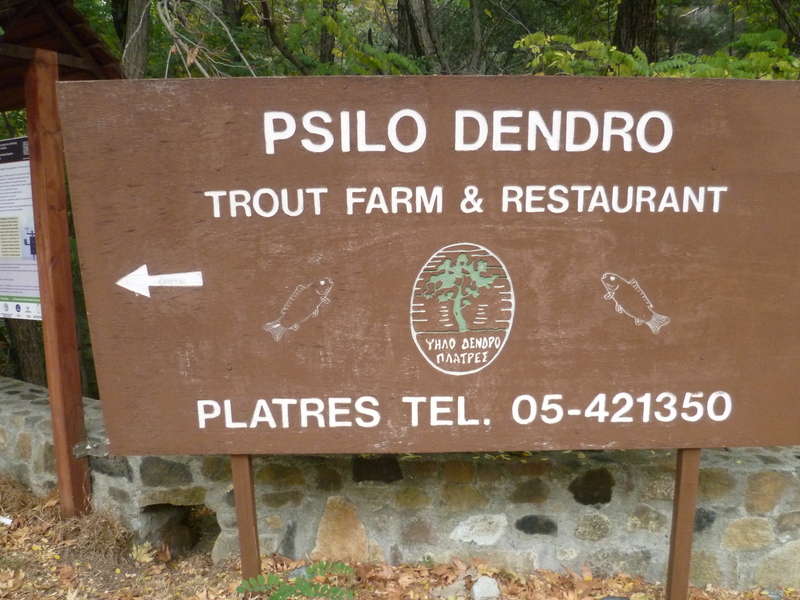 Return to Psilo Dendro along this track and you will arrive back at your start point after 6 hours 5 minutes. There are a couple of options to include the Loumata tous Aetous nature trail in this walk. 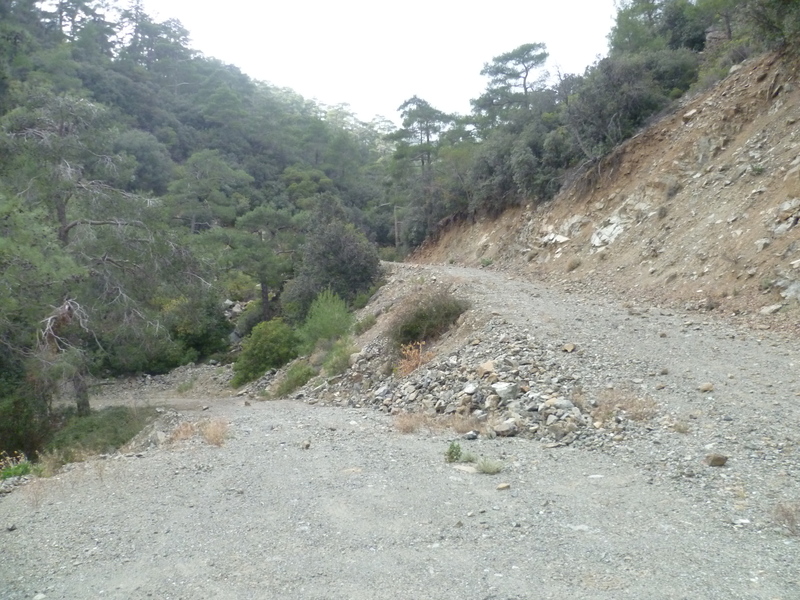 This is trail 52 on the CTO Troodos Map Western Area. It is a very pretty gorge walk with spectacular cliffs and fairly dense, by Cyprus standards, forest. Also some EOKA hideouts. The path runs alongside a stream which might make the walking more difficult in winter/spring. We last walked this trail in May 2018 and although it remains a beautiful addition, some of the trail has been eroded by rain and rockfalls. You will need to be reasonably nimble to navigate some of the stream crossings in places, particularly in winter and after rain. At the 2 hours 40 minutes point you should carry on walking into the village of Kato Amiantos and turn left when – after 10 minutes – you reach the main F972 road. Walk about 5 minutes along the pavement of this road past a cafe on your right and, just beyond a right-hand bend, turn left to reach the start of the trail. The trail goes up the gorge and doubles back on itself. Dog-leg back and climb along the trail to the end, past wooden palings that you could see from earlier in the trail high on your left. At the end of the trail there is a noticeboard. 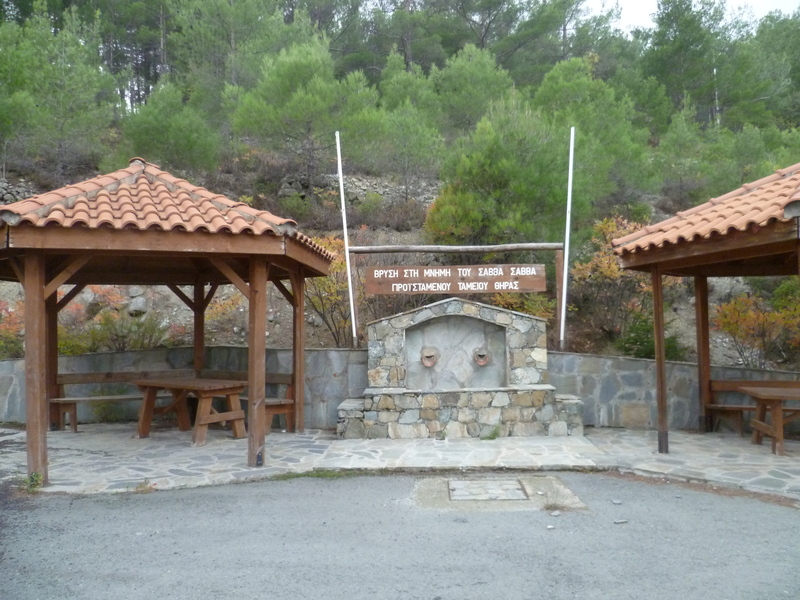 Turn right here and walk along the road till you reach the Savva Savva’s fountain. Add around an hour to the main walk if you want to include this nature trail.